In order for UK documents to be recognised in Saudi Arabia the documents must be correctly legalised. The process for this depends on the nature of the document. If your personal documents are being presented to an authority in Saudi Arabia they will need to be correctly legalised. We can take care of the full process for most documents. If this is required for a degree certificate then you should firstly arrange for the document to be stamped by the Saudi Cultural Attache. To proceed, simply order the required service online and send your documents to us with a copy of your passport(s)*. For advice or to discuss your documents please get in touch with our legalisation team. Processing time 7-10 days for most orders. We are pleased to assist with ensuring your degree or membership certificate is correctly legalised for use in Saudi Arabia. Unfortunately, we are not able to assist with legalising other academic documents (e.g. GCSE certificates or School Letters). The Saudi Cultural Attache will then contact the institution that issued the degree to verify the authenticity of the document. The timescale for this is dependent on how quickly the University responds to this request. Once the application is successful the stamped document will be available online on the SCA site. From this point, you can send the original degree, the stamped copy of the degree and a copy of your passport to us. We will then arrange for the document to be solicitor certified, issued with the apostille and attested by the Saudi embassy. The fee for this service is £171.00 and this process takes approximately 7-8 working days all being well. Companies conducting business in Saudi Arabia will often be asked to legalise various company documents. We can arrange for UK company documents to be solicitor certified, issued with the Foreign and Commonwealth Office Apostille, stamped by the Chamber of Commerce and then attested by the Saudi embassy. This process takes approximately 15 working days. The fee for the full Saudi legalisation service for commercial documents can vary depending on the documents in question. Contact us today via phone or email for advice. 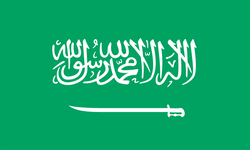 What does the Saudi attestation look like? 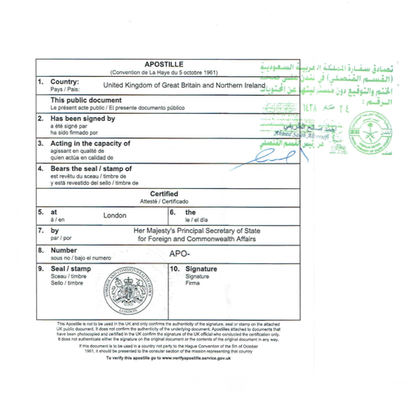 All documents will be issued with the UK apostille prior to being submitted to the embassy. The embassy will then apply an ink stamp across both the apostille and the document itself. If the documents are of a commercial nature these will also be stamped by the Chamber of Commerce. Likewise, if the document is a degree certificate this will also be stamped by the Saudi Cultural Attache. For advice or to discuss your documents please contact us today. It is important to note that the timescales can fluctuate. If we are unable to complete the embassy attestation a refund will be issued.